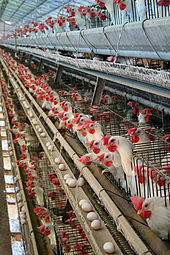 Poultry farming is the process of raising domesticated birds such as chickens, ducks, turkeys and geese for the purpose of farming meat or eggs for food. Poultry – mostly chickens – are farmed in great numbers. Farmers raise more than 50 billion chickens annually as a source of food, both for their meat and for their eggs. Chickens raised for eggs are usually called layers while chickens raised for meat are often called broilers. Intensive crop farming is a modern form of intensive farming that refers to the industrialized production of crops. Intensive crop farming’s methods include innovation in agricultural machinery, farming methods, genetic engineering technology, techniques for achieving economies of scale in production, the creation of new markets for consumption, patent protection of genetic information, and global trade. These methods are widespread in developed nations. An orchard is an intentional planting of trees or shrubs that is maintained for food production. Orchards comprise fruit– or nut-producing trees which are generally grown for commercial production. Orchards are also sometimes a feature of large gardens, where they serve an aesthetic as well as a productive purpose. A fruit garden is generally synonymous with an orchard, although it is set on a smaller non-commercial scale and may emphasize berry shrubs in preference to fruit trees. Most temperate-zone orchards are laid out in a regular grid, with a grazed or mown grass or bare soil base that makes maintenance and fruit gathering easy. Useful within-field diversity (polyculture): companion planting of carrots and onions. The onion smell puts off carrot root fly, while the smell of carrots puts off onion fly. Crop diversity is the variance in genetic and phenotypic characteristics of plants used in agriculture. Over the past 50 years, there has been a major decline in two components of crop diversity; genetic diversity within each crop and the number of species commonly grown. A cotton picker at work. The first successful models were introduced in the mid-1940s and each could do the work of 50 hand pickers. Mechanised agriculture is the process of using agricultural machinery to mechanise the work of agriculture, greatly increasing farm worker productivity. In modern times, powered machinery has replaced many farm jobs formerly carried out by manual labour or by working animals such as oxen, horses and mules. Natural farming is an ecological farming approach established by Masanobu Fukuoka (1913–2008), a Japanese farmer and philosopher, introduced in his 1975 book The One-Straw Revolution. Fukuoka described his way of farming as 自然農法 (shizen nōhō) in Japanese. It is also referred to as “the Fukuoka Method”, “the natural way of farming” or “do-nothing farming”. The title refers not to lack of effort, but to the avoidance of manufactured inputs and equipment. Natural farming is related to fertility farming, organic farming, sustainable agriculture, agroecology, agroforestry, ecoagriculture and permaculture, but should be distinguished from biodynamic agriculture. Soil steam sterilization (soil steaming) is a farming technique that sterilizes soil with steam in open fields or greenhouses. Pests of plant cultures such as weeds, bacteria, fungi and viruses are killed through induced hot steam which causes vital cellular proteins to unfold. Biologically, the method is considered a partial disinfection. Important heat-resistant, spore-forming bacteria can survive and revitalize the soil after cooling down. Soil fatigue can be cured through the release of nutritive substances blocked within the soil. Steaming leads to a better starting position, quicker growth and strengthened resistance against plant disease and pests. Today, the application of hot steam is considered the best and most effective way to disinfect sick soil, potting soil and compost. Intensive pig farming is a subset of pig farming and of Industrial animal agriculture, all of which are types of animal husbandry, in which livestock domestic pigs are raised up to slaughter weight. These operations are known as AFO or CAFO in the U.S. In this system of pig production, grower pigs are housed indoors in group-housing or straw-lined sheds, whilst pregnant sows are housed in gestation crates or pens and give birth in farrowing crates. 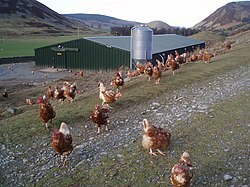 Free range denotes a method of farming husbandry where the animals, for at least part of the day, can roam freely outdoors, rather than being confined in an enclosure for 24 hours each day. 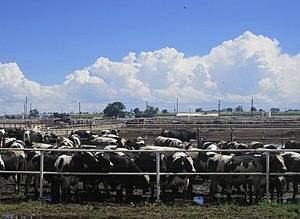 On many farms, the outdoors ranging area is fenced, thereby technically making this an enclosure, however, free range systems usually offer the opportunity for the extensive locomotion and sunlight that is otherwise prevented by indoor housing systems. Free range may apply to meat, eggs or dairy farming. Sheep farming is the raising and breeding of domestic sheep. It is a branch of animal husbandry. Sheep are raised principally for their meat (lamb and mutton), milk (sheep’s milk), and fiber (wool). They also yield sheepskin and parchment. … that over a million cockroaches escaped when an unregulated cockroach farm building was bulldozed while the owner was out to lunch? … that during the karuka harvest, entire households move upland and start speaking a pandanus language? … that maize, cacao, and achiote were historically the main crops produced in El Progreso, Guatemala? … that the littleneck clam is harvested for food despite being associated with paralytic shellfish poisoning? … that though the onion thrips is tiny, it is the most serious insect pest attacking onion crops in the tropics? … that the bluegrass billbug feeds on maize and other grain crops as well as on Kentucky bluegrass? Do you have a question about Agriculture that you can’t find the answer to? For editor resources and to collaborate with other editors on improving Wikipedia’s Agriculture-related articles, see WikiProject Agriculture.